When it comes to reflection filters, Aston thinks that size matters. 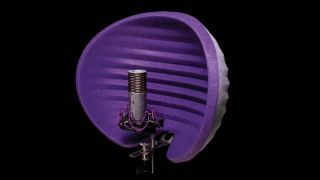 There are several companies offering their take on the reflection filter concept, but with Halo, Aston Microphones has come up with something that represents a huge leap forward. This retails for £199, but the company has four to give away to MusicRadar users. When compared to other products, Halo promises better isolation, absorption, mounting hardware and all-round performance, giving you the best possible chance of making great recordings. It's larger than many of its rivals, and is made from a patented lightweight PET felt. To be in with a chance of winning this slice of next-gen studio technology, head on over to the competition page and get your entry in. The competition is open until 1 June, and the four winners will be chosen at random.